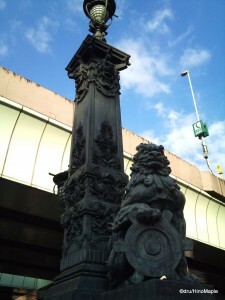 Nihonbashi can easily be considered the centre of Japan. It is the point where ALL roads are measured. When approaching Tokyo along one of the many highways and expressways, they almost always measure distance to Nihonbashi. This is in stark contrast to the way things are done in different prefectures and cities where the zero mark is based on the official government offices. In fact, while most cities in Japan consider their major train stations to be the centre of the city, it’s rarely used as a distance marker. Nihonbashi is one of the few exceptions. The bridge, Nihonbashi, was built originally in 1603 and rebuilt in 1911. The 1911 version is what you will see today if you do head to Nihonbashi. It’s a beautiful looking bridge with various sculptures adorning the bridge. It is still used heavily to this day, although it is no longer a major thoroughfare for cars. When walking along the bridge, you will be surprised by the beauty and majestic image the bridge portrays, and the fact that they recently power washed it (end of 2010), really brings the original beauty out of the bridge. It doesn’t look old at all, aside from the styling. It has been well maintained over the years and hopefully, it will stay for a lot longer. The only blight against this Nihonbashi is the fact that in the 1960s, the government erected a huge overhead expressway that flowed along the Nihonbashi River. This highway barely passes overhead and the tall statues show it. You can see some of the tall statues in the middle of Nihonbashi stretching up between the lanes of the expressway overhead. It’s an interesting sight, and some people feel that this is what Nihonbashi should look like. There is a tug-o-war for people who wish to see the expressway moved underground to restore the original beauty of Nihonbashi. 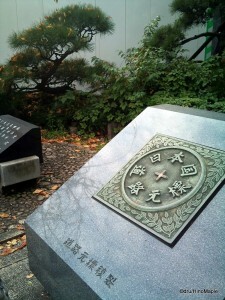 Others claim that the expressway can show Japan’s modernization and true history. I agree that it shows Japan’s quick ambitions to rise and meet any challenges that it faces, but ugly is still ugly. 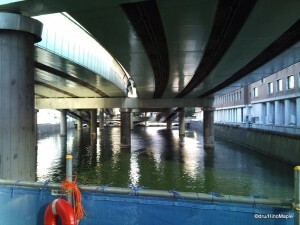 It would be far better if the bridge was free from overhead unsightliness. Alas, this is the problem that Nihonbashi, the district, faces everyday as the world changes. The Nihonbashi district is a somewhat unique area. It is well known for being part of the business core in Tokyo. The old business core used to be the skyscrapers in Shinjuku, and by all means, it’s still a business hub, but for finances, you are hard pressed to find a better area than Nihonbashi. When combined, Nihonbashi, Otemachi, and Marunouchi make the financial core of Tokyo. These three areas are easily accessible on foot and can be walked from end to end in about 30 minutes. Nihonbashi is home to three financial institutions and the Bank of Japan. While this doesn’t sound amazing, when you walk around Nihonbashi for the first time, you’ll be surprised at how small it truly is. Many will say that Nihonbashi stretches out towards the Sumida River which would increase its size dramatically, but if you are being a purist, the area can easily be walked on foot within an hour. It is within this small centre that you will find all of these institutions. While most people will find the financial institutions to be very boring, myself included, there is a lot more to see and do within Nihonbashi itself. Shopping is where Nihonbashi truly excels, like many areas of Japan. If you are looking for traditional Japanese products, this is a good place to go. You can find various traditional products such as Japanese paper, old hand carved toothpicks, and much more. Nihonbashi isn’t considered one of Japan’s oldest neighborhoods for nothing. They have a large array of old and new mixed together. Many of the old shops have been demolished, but the original owners have re-opened in the newer buildings. Others have also taken their places and you can find many good traditional Japanese sweets within the area. I would highly recommend a visit to one of these shops if you can. There are also department stores that specialize in the higher end goods, and for the older generations. 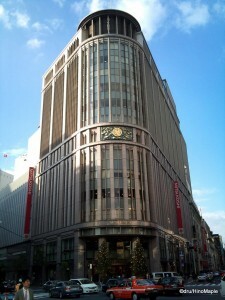 Mitsukoshi is the first department store in Nihonbashi, and their main building is considered an historical building. I would recommend a visit just to soak up the atmosphere. Takashimaya and Coredo are also located here and shouldn’t be missed. If you are wondering what the difference is between Nihonbashi and Ginza, there isn’t much, but there are subtle differences. Ginza tends to be a posh area with younger people with lots of money to spend. Think of a new izakaya that is expensive and extremely popular. Nihonbashi feels more alike a refined sake; one that has aged and matured over time. It has a feeling of being in an exclusive club, and if you don’t belong, you might be left out. While I doubt that the shops will make you feel like an outsider, the air of the area is special. I did mention that Nihonbashi is a small area, but that shouldn’t stop you from exploring the neighboring areas either. For one, you should head west along the river. 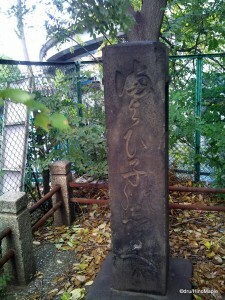 If you head towards Ichikokubashi, you will see, on the south west corner a small marker next to the bridge at the entrance of a public park. This is a very rare marker and an interesting history lesson for anyone. The marker itself is a lost and found stone. If you lose a child, or you find a child, you can post a note on either side of the stone and hope someone finds it. For example, if I find Taro Suzuki, and I’m looking for his mother, Hana, I can write a description of him, and his name and put it on the found child side. The opposite is also true. From there, if his parents or caregiver found the note, they can move it to the reunion side which posts a meeting time and location for people. It’s not always a happy story, but I’d like to think that more times than not, children are reunited with their parents. Nihonbashi is an often overlooked and skipped area of Tokyo. By all means, if you are only in Tokyo for a few days, it’s not a place I’d recommend a visit. If you are in Tokyo for 2 weeks, and not venturing out to the outlying areas, I’d definitely recommend a visit to this area. There are many things to see and do in a short time, and it’s a very short walk to get to the other various areas surrounding Nihonbashi. It’s easy to walk over to Tokyo Station, and Akihabara is just a few stations away as well. If you are considering a visit to either Nihonbashi or Ginza, I’d probably choose Ginza as it’s more famous and what most people want to see, however, Nihonbashi is a good substitute if you understand what you might be missing in Ginza. 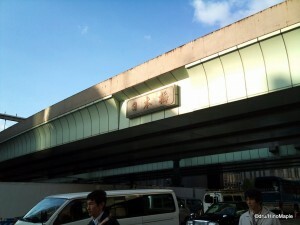 This entry was posted in Tokyo and tagged japan, Mitsukoshi, Nihonbashi, shopping, tokyo, お買い物, 三越, 日本, 日本橋, 東京 by Dru. Bookmark the permalink. Well done here, much enjoyed it. You should mention that Will Adams lived in Nihonbashi and that it was here that the first fish market was located until 1923 — on the north end of the bridge — and that the Mitsukoshi Dept store was originally called the Ichigoya, and the Mitsui family that started it were given the monopoly to change rice to coins and was the origin of the Mitsui Financial Group located next door to the Mitsukoshi — current building 1929. Mitsukoshimae Station is the only station in Tokyo that has the name of a public retail establishment. Nihonbashi is also the site of the first docks for offloading gold and silver bouillon taken to Tokiwa currently the Bank of Japan. Thanks for the great information, and the comment! I didn’t know the fish market was there, but considering that Tokyo Bay was once up to Nihonbashi, it does make sense.